Astronauts Dale Gardner and Joseph Allen have a little fun on one of their EVAs. 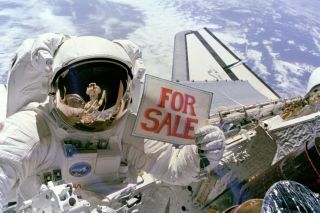 In this historical photo from the U.S. space agency, Astronaut Dale A. Gardner, having just completed the major portion of his second extravehicular activity (EVA) period in three days, holds up a "For Sale" sign refering to the two satellites, Palapa B-2 and Westar 6 that they retrieved from orbit after their Payload Assist Modules (PAM) failed to fire. The photo was taken November 14, 1984. Astronaut Joseph P. Allen IV, who also participated in the two EVAs, is reflected in Gardner's helmet visor. A portion of each of two recovered satellites is in the lower right corner, with Westar 6 nearer Discovery's aft.